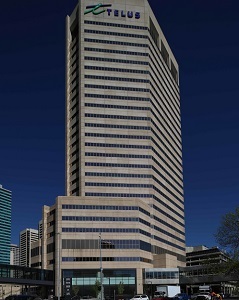 Hines and Oaktree Capital Management have closed the purchase of Calgary’s First Tower office building, and plan a “significant capital upgrade program” to reposition the half-vacant class-B property. The two U.S.-based firms announced the acquisition Wednesday — Oaktree on behalf of a “subsidiary of real estate funds” it manages. No financial terms were released. “We are pleased to acquire this office asset where we have the ability to provide a compelling value proposition to our tenants,” Hines managing director Syl Apps said in a prepared statement. “As a firm, we believe in, and are committed to, the City of Calgary with First Tower being Hines’ second office acquisition during the recent energy downturn. In fact, it has several interests in Calgary. In 2016, Hines acquired 505 2nd Street SW, an eight-storey office building next to the Calgary Petroleum Club in downtown Calgary. The building, constructed in two phases in 1959 and 1966, contains 121,782 square feet of space. Hines was brought on as a development partner by several co-owners of the Eighth Avenue office complex, and is also building the 500 Block residential tower at 12th Avenue and 4th Street SW., in Calgary. First Tower is a 27-storey building comprising 708,354 square feet situated in downtown Calgary, where vacancy rates continue to hover around the 26 per cent rate (according to Avison Young’s Q4 2017 report) after taking a significant hit during the oilpatch downtown of 2015 and 2016. Located at 411 1st Street, the building is connected to Calgary’s +15 Skyway network, and provides efficient floorplates and unobstructed views to the Bow River and the east. It is currently 51 per cent leased to several tenants, anchored by Encana, Telus and TransCanada. Previous owners H&R REIT (HR-UN-T) and Dream (DRM-T) say the building recently received a $17-million upgrade to the main lobby and exterior, which also included a new plaza and outdoor seating areas, landscaping, handicap accessibility and podium signage. H&R says First Tower was built in 1981, has attained Energy Star 87 and was pursuing LEED Gold O&M Certification. Hines and Oaktree plan to take those improvements further, bringing the building to class-A standard. “In particular, a comprehensive redevelopment of the 34,000-square-foot +15-level will provide First Tower’s tenants with a highly differentiated amenity package and materially improve the activation and user experience of the building,” says Hines in a release. The improvements will include a tenant lounge/collaboration area; café and food service area; outdoor terrace; state-of-the-art fitness and wellness centre; and a modern, flexible conference facility. First Tower is well-served by transit and two blocks south of the recently upgraded Riverwalk. In addition, the location will see continued improvement in the coming years as the neighbouring East Village area continues to benefit from public infrastructure improvements and private developments. “We are excited to acquire First Tower with our partner Hines, who has consistently demonstrated an ability to deliver on premier repositioning plans and provide tenants with the highest level of management and service,” said Oaktree managing director Ambrose Fisher in the release. Hines is a privately owned global real estate investment firm founded in 1957 with a presence in 201 cities in 24 countries. Hines has approximately $111 billion of assets under management, including $60 billion for which Hines provides fiduciary investment management services, and $51 billion for which Hines provides third-party property-level services. Historically, Hines has developed, redeveloped or acquired 1,295 properties, totalling more than 422 million square feet. The firm’s current property and asset management portfolio includes 506 properties, representing more than 210 million square feet. Oaktree is a leader among global investment managers specializing in alternative investments, with $100 billion in assets under management as of Dec. 31, 2017. The firm emphasizes an opportunistic, value-oriented and risk-controlled approach to investments in distressed debt, corporate debt (including high yield debt and senior loans), control investing, convertible securities, real estate and listed equities. Headquartered in Los Angeles, the firm has more than 900 employees and offices in 18 cities worldwide.